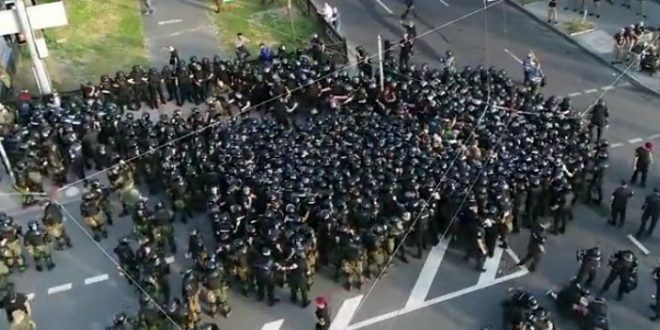 UKRAINE: Hundreds Of Riot Police Swarm And Teargas Far-Right Extremists At Kiev Pride, 56 Arrested [VIDEO] - Joe.My.God. Ukrainian police said they had detained 56 members of far-right radical groups in Kiev on Sunday after scuffles before the capital’s gay pride march. Early in the morning, more than 150 far-right protesters had sought to block off the route of the march through central Kiev. Small clashes broke out when police in riot gear moved to clear the street. “Several men who resisted and used gas canisters against law enforcement officers were detained,” the police said in a statement. Far-right group C14 said police had surrounded its protesters, attacking them with batons and tear gas. “Look at how they protect ‘sexual minorities’ and violate the rights of regular Kiev citizens,” it said in a post on Facebook. More people were detained in a subsequent altercation near the Opera House, police said. The first drone video below is really something.